Manufactured in Etats-Unis from 1941 until 1948. Special thanks to JP G. for his action. The Medalist is a healthy baby, paunchy, heavy. This must be why I like it. Birds of feather flock together. This is to be said before receiving derogatory remarks. 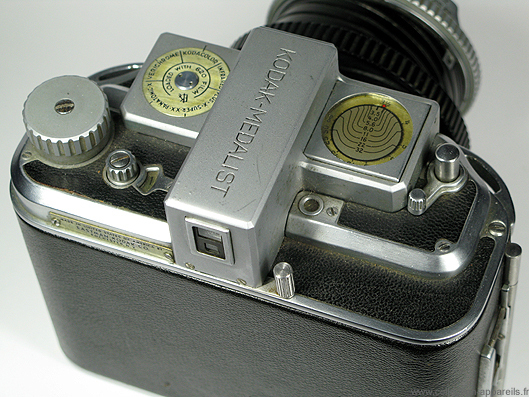 In 1941, on the basis of the film 620, Kodak created this camera with promising technical specifications. It is telemetrically ... strange. The base of the rangefinder is wide. We clearly see two rectangular windows, symmetrical to the eyepiece. Until then, normal. On the back, it is not. Under the rear window of the viewfinder, there is a small window which is the range finder. 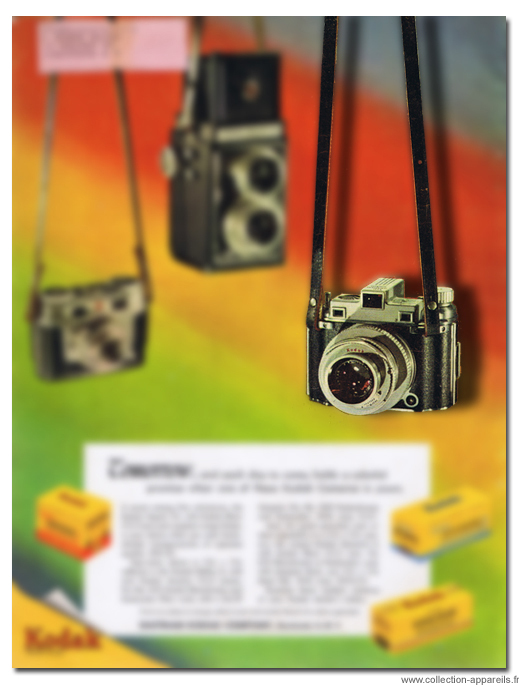 The rangefinder is in two superimposed horizontal images. The top image corresponds to the right window. This may seem strange as a way to have therangefinder window, but the use is very convenient, because without changing the target, it is possible with a very slight movement of the eye to switch from the rangefinder to the viewfinder .Rangefinder is enlarging. Great! I just forgot to say that the rangefinder is coupled to the distance setting on the lens. 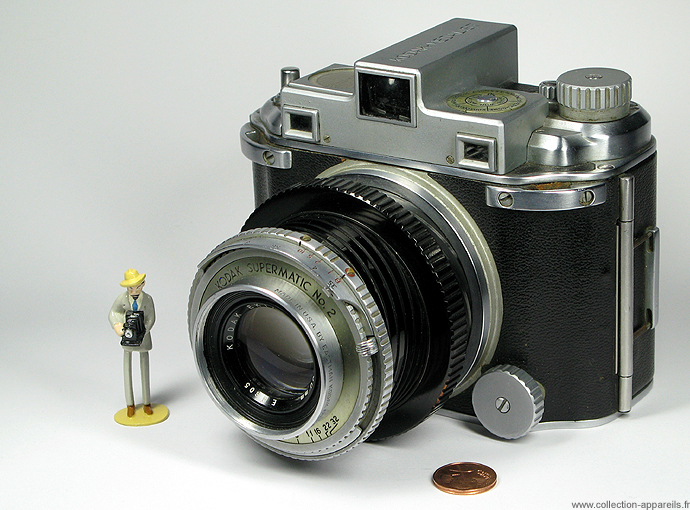 The lens is an Ektar 3.5 / 100mm, the rear lens is treated. 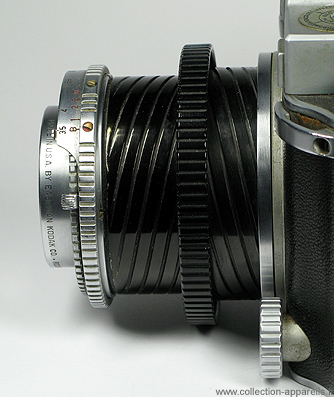 The shutter Kodak Supermatic 2 reaches the 1/400th of a second. It has a very pronounced tendency to scrub. 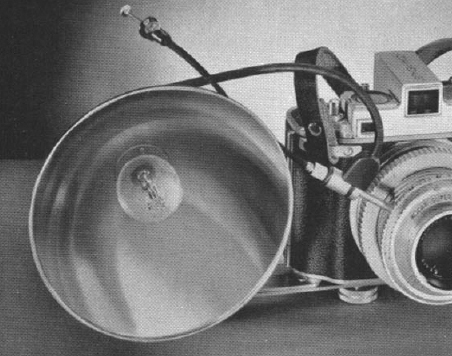 The lens and shutter are mounted on a retractable tube. This tube, for a faster and more precise manipulation, is made of two concentric tubes each having a helical ramp inverted relative to each other. A single ring allows to slide the tubes one inside the other and return the assembly into the body of the camera. A wheel on the base of the front allows to do the same. The rotation of one or other of the two means sets the distance of focus. On top of the body, to the right of the viewfinder, a depth of field table is automatically set when the distance is changed. The shutter also allows the bulb exposure. 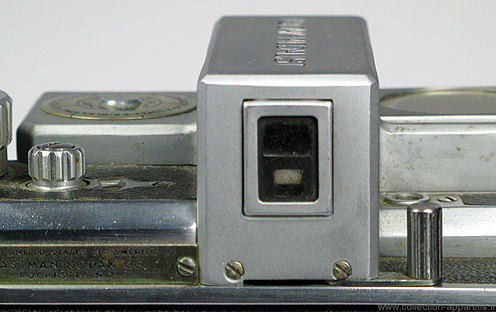 In this case, the small lever concentric to the shutter button has to be moved to the right. The camera offers a protection against double exposure. When the film is advanced, the shutter is cocked. A red dot appears in a small window near the trigger. If you wish to make a double exposure, you must push to the leftmost possible the lever located below the viewfinder. This position is strange and we may think first seeing this lever that it is viewfinder dioptric adjustment. This model has no real sync. People had to wait for the Medalist II in 1946 to have one. But the Kodak ingenious people proposed as an accessory a special cable release that triggered, by a single push, the shutter and the flash. The back of the unit can be disassembled to fit another back, allowing the use of plates or film packs.